Sixflags Great Adv.=Worlds Tallest Fastest! Sixflags Great Adventure in New Jersey will soon have the Worlds Tallest Fastest Roller Coaster! That means we will beat Cedar Point's Top Thrill Dragster, which by the way is 420 ft and takes riders 120mph. 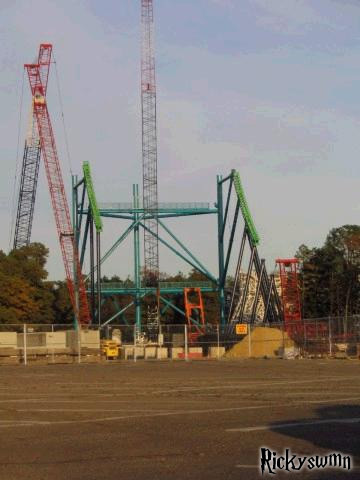 I'm so excited for the 2005 season for Sixflags! Additional information will be on sept. 29 this upcoming weds on Sixflags.com and Gadv.com Great Adventure source and gadvcentral.com also on that day! The actual height, lengh and name will not be realeased until weds sept 29. But your offical info will be on sixflags.com/greatadventure. I tried to make an image but screw it, here's the link. Its so cool Check it out! edit: Also, you have to check this out!!!!!!!! A very cool "intro" to the coaster! Nice. I gotta take a ride on that. The press release is almost here! Just 2 more days until weds. There will be a video and everything on sixflags.com. I'll post it here too! Anyway, here is the "OFFICIAL" information. It saids everything about the new roller coaster and much more! Come and read! Check out the video also! And also, read more and find out we are getting a BRAND NEW SECTION to the park!! YAYYYYYY! That's crazy! I love thrill rides but I might would chicken out on this one.